The passage of time brought stirrings and then remarkable restoration of life to slopes devastated by the 1980 eruption that transformed Mount St. Helens, the "American Fujiyama," into a mountain shaped like an open-ended football stadium. 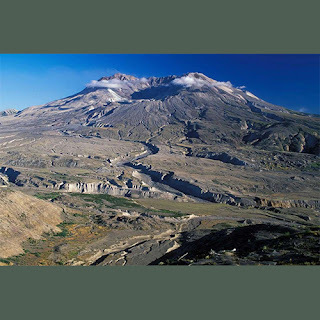 In another way, time has provided room for the perspective and retrospective brought to the eruption by Steve Olsen in his new book "Eruption: The Untold Story of Mount St. Helens" (W.W. Norton & Co., $29.95). "Eruption" is a bouillabaisse of a book, blending ingredients of history and science, volcanology and clear-cutting, "Big George" Weyerhaeuser and Dave Johnston of the U.S. Geological Survey. It was Johnston who radioed word of the great lateral blast with the words, "Vancouver, Vancouver! This is it!" and was enveloped a moment later. Anyone new to the story will cringe at the scene in which President Carter asks: "What do you need specifically?" "M-O-N-E-Y" replied a boorish Washington Gov. Dixy Lee Ray,. It was Ray, both villain and clown, who set boundaries of the red (exclusion) zone in the weeks before the eruption so that Weyerhaeuser could go on clear-cutting its land, even as a growing bulge on the north side of the mountain had loggers scared silly. "Big George" Weyerhaeuser decreed that the cutting should go on. If the eruption had not taken place on a Sunday morning, hundreds of his employees would likely have been killed. Of the 57 who lost their lives, only three were in the red zone. Olsen ranges wide in the ingredients for his book. He discusses the famous land purchase negotiated by Frederick Weyerhaeuser and his St. Paul, Minnesota, neighbor, railroad baron James J. Hill. The deal totaled 900,000 acres, set the stage for the Big W's big presence in the Northwest, and included the lucrative, heavily cut-over land between Interstate 5 and Mount St. Helens. Reporters, and even Carter's party, would marvel at stripped moonscapes while flying toward the mountain. Locals gently informed them that they were flying over Weyerhaeuser clear cuts and were not yet over the blast zone. Olsen is at his best when discussing the lateral blast, which produced devastation north and west of the volcano. He brings in a similar eruption of Bezymianny, a peak on the Soviet Union's Kamchatka Peninsula. The Cold War kept U.S. scientists away from Kamchatka, while their Russian counterparts were barred from St. Helens. Not all the ingredients work. An unfocused chapter on Gifford Pinchot and the origins of the U.S. Forest Service is plunked in just before St. Helens blows. It doesn't really discuss that Pinchot's namesake national forest had been turned into a cutting zone largely indistinguishable from Weyerhaeuser lands. Olsen is at his best in describing the lives of those who lost their lives on May 18, 1980, where they were and how they perished. The descriptions border on intimate, but are in no way patronizing. Olsen suggests a provocative thesis, namely that the Mount St. Helens eruption represented a "dividing line" in Northwest history. It was a turning point between the "old Northwest," the resource-extraction economy represented by loggers who went on working on a dangerous mountain, and a new Northwest erected on ideas and technology with much forest land protected. Volcanoes are enormous in impact, whether in altering topography or influencing the Earth's climate. In late July 1980, this reviewer was exiting the remote Bubagoo Spires in the Purcell Range of British Columbia, on a sparkling, totally clear day. Suddenly, a strange cloud loomed to the south, moved our way and darkened the sky. It was an ash cloud from Mount St. Helens, hundreds of miles away. Later, just outside Canada's Waterton Lakes National Park, we learned that Cardston, Alberta, rests on ash from a long-ago eruption of Glacier Peak. A fascinating topic makes for a fascinating book.